After 22 years of a professional partnership, interior designers William Diamond and Anthony Baratta know their strong points: an obsessive attention to detail, a sumptuous color sense, a fearless use of pattern, and an overall sensibility that cannot escape being described as American. So it took some doing for a Manhattan couple – she’s a lawyer, he’s a money manager – to explain to the designers exactly what they wanted in their Upper East Side town house. It wasn’t that the clients didn’t know. 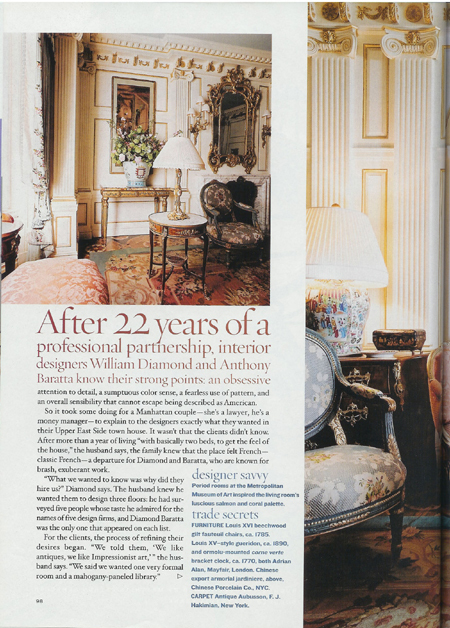 After more than a year of living “with basically two beds, to get the feel of the house,” the husband says, the family knew that the place felt French – a departure for Diamond and Baratta, who are known for brash, exuberant work. “What we wanted to know was why did they hire us?” Diamond says. The husband knew he wanted them to design three floors: he had surveyed five people whose taste he admired for the names of five design firms. Only one name appeared on each list, Diamond Baratta Design. That expedition focused the designers, however. “This is the first time for us doing this level of really formal, formal French feeling,” Diamond says. “The client put so much trust in us,” adds Beretta, who handles the pair’s architectural work, which on this project meant distilling the ancient regime the was a chef reduces a sauce. The clients decided to remain true to the late-nineteenth-century origins of the town house. For New Yorkers back t hen, “it was typical to have different styles or periods in each room,” Baratta says. Thus, the second-floor family room is Dutch, with wainscoting painted pale butterscotch and topped by dark tartan fabric. A Turner-esque landscape painted on a panel above the fireplace disappears to reveal a large, flat-screen television. The wool needlepoint rug designed by Diamond suggests a Scottish paisley shawl: a riot of blues and rusts that echo the ornately patterned silk velvet upholstery on the nineteenth-century sofa. The rug challenged its Portuguese makers. “There is no repeat in the design,” says Anthony Monaco, co-owner of A.M. Collections, Ltd., and that meant that each stitch had to be compared with Diamond’s drawing. Getting the rug right took months. The library, also on the second floor, is English, with custom-designed mahogany woodworking. A Sheraton-style satinwood revolving book stand holds overflow from the bookcases. Diamond designed the Aubusson-style rug in tone up on tone of gray-blue-green and ochers, which reappear in the silk damask drapes and a seven-foot-long tufted sofa that encourages napping. The ceiling is chinois gold papier, a material Diamond had never used. Throughout the project, the designers’ famed, usually invisible army of skilled craftspeople came into its own. Mikhail Rakovsky, a Russian architect in the designers’ office, sketched full-scale drawings until the e project had some 100 pages of blue-prints. “He’s from St. Petersburg, so this style was in his blood,” says Baratta, who designed the dining room’s decorative plaster ceiling three times before he felt satisfied that he had simplified the French inspiration in a suitably Scandinavian manner. Diane Warner and her partner, Robert Garey, spent five months painting and installing decorative fitted canvas panels for the dining room walls. The delicate garlands of old-fashioned roses in the soft shades of coral, salmon, rose, and yellow are based on the botanicals of Pierre-Joseph Redoute, who painted wall panels for Napoleon’s Josephine. For the dining and living rooms, Warner and Garey used transparent paints and glaze to execute a verbatim copy of the inlaid wood of Catherine the Great’s bedroom floor in St. Petersburg’s Pavlosk Palace. The design, which also appears as a composite on two of the landings, is painted, not stenciled, on the oak flooring. Diamond designed the hand-woven Aubusson-style rugs in the dining room and library. 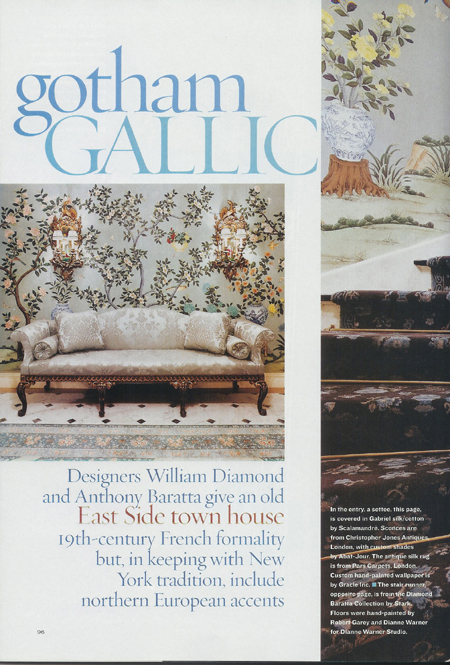 The thick wool runner that covers five flights of stairs is Diamond and Baratta’s design, based on elements from an early-twentieth-century Chinese carpet and eighteenth-century floral patterns. It is these stairs that make apparent the design challenges inherent in this house, which is 17 feet wide but very deep. 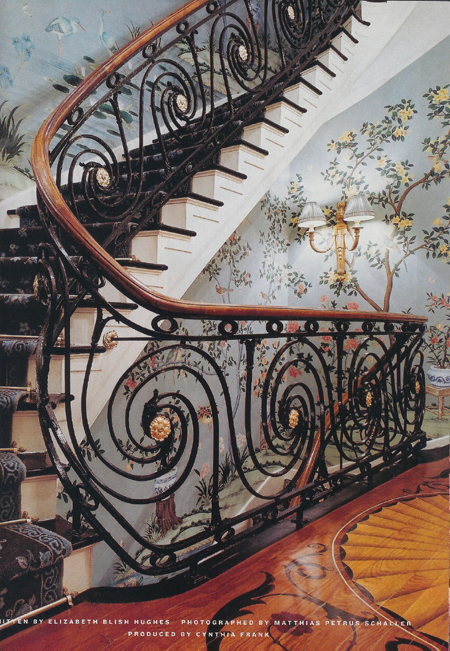 The graceful curving staircase divided floor into a front and back room, with a narrow landing between. The main stairs consume almost a fifth of the house’s 7,500 square feet, which is too much to be ignored.